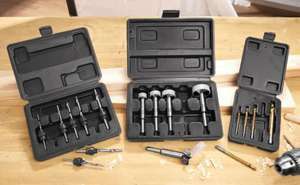 5 Piece Forstner Drill Bit Set. Not sure what sizes these come in. Ideal for drilling larger holes in tight spaces. I bought these the last time they were on offer as backups/alternatives to a hole saw and they perform brilliantly for the price. Also two other drill bit types on offer. Forstner bits are really useful as they are the only bits that can cut part of a hole. I use similar bits to get the majority of wood out of the hinge cuts when hanging doors, then square up with chisel. Much quicker than chisels alone. used them for making holes for pipe running through joists. I use them to make really big peg boards! Got no use for these at the moment but I will get some anyway cos you never know. Got no use for these at the moment but I will get some anyway cos you … Got no use for these at the moment but I will get some anyway cos you never know. buy them, forget about them, do a job, realise after "that would have been so much easier if i had used 'xyz'"
Buy them... Put them into big garden shed... Never find them when you actually need them! going to get me a set of these along with a knife sharpener! Can cut nice round holes in laminate for radiator pipes. I've used mine 8 times now that's 2 and 2/3 holes per pound. How do you cut 'part' of a hole? oO Do you mean a semi-circular hole, or a recess like you'd make for a kitchen hinge? I got a set today, seem ok quality. Cheers for this, bizarrely I needed a set just now! How do you cut 'part' of a hole? oO Do you mean a semi-circular hole, or … How do you cut 'part' of a hole? oO Do you mean a semi-circular hole, or a recess like you'd make for a kitchen hinge? Yes with a forsner bit you can cut both a hole with a flat bottom for something like a cabinet hinge and or a hole that goes beyond the edge of the work ie half a hole. Clearly it's best to cut this type of hole with a drill stand and the work well supported and clamped firmly.